Last night, Mike told me that my posts are much too long. I agreed with him--I realize that very few people probably read them through in their entirety--but then, I remembered why I keep writing all these reviews anyway. One of the main reasons is just to help myself remember what I read. Quite often, I include certain details to help spark my memory months or years later, in effect making it so that the book lasts much longer than just the time it takes me to read it. So, sorry but not sorry, folks, you get a pageful. And now, on to this book, which, admittedly, is just a quick read and doesn't have a lot of substance, but which I (surprisingly!) have a lot to say about nonetheless (sarcasm intended). 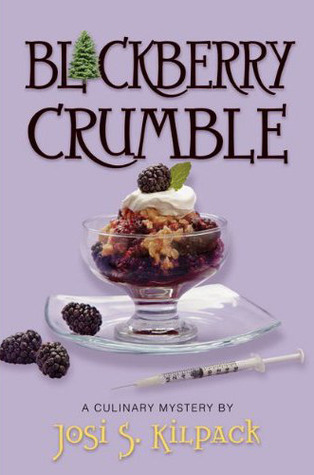 This is the fifth installment in a culinary mystery series starring Sadie Hoffmiller, a 50-something retired school teacher who can't keep her eyes and ears out of other people's business. Unfortunately, for the last nine months or so of her life, "other people's business" has included murder, and Sadie has become directly involved. At the beginning of this story, Sadie finds out that an article about her has just been printed in the Denver Post. It casts her in a very unfavorable, even scandalous, light, asking how it is possible for one middle-aged woman to be in the middle of so many murder investigations. All of her acquaintances begin whispering about her, and Sadie is mortified. You would think then that when an unknown woman approaches Sadie, asking her to look into and investigate her father's sudden and unexpected death, Sadie would run the other way (and work to build back her reputation!). But of course she takes the case. She's Sadie, after all, and she can't stand an unsolved mystery. As with the other books in the series, this was just a fun one to be in the middle of. I've discovered that with these books, I far prefer the actual reading to the finishing because I almost always hate the endings (this one was no exception). You would think the endings would maybe dissuade me from reading any more of them, but I keep coming back because I like the middles so much. Yes, unfortunately, the ending left me dissatisfied and irritable. (Warning: spoilers ahead! Read at your own risk, starting now...!) I've read enough of Sadie Hoffmiller to know that the murderer is going to be the person I least expect, which now means that the least-expected person is the MOST-expected person (so it seems like Josie Kilpack's system is backfiring). But even I, with all my prior Sadie Hoffmiller experience, did not originally suspect Lois (the kind, elderly neighbor with a penchant for trendy fashion). However, later in the book, I realized it had to be her because a) she was the least suspicious and b) Kilpack has never had a female murderer, so to make it an elderly female murderer? Oh, too perfect. I audibly sighed in exasperation when I realized who the murderer was. I had been enjoying the book so much, and now, once again, it was ruined. I didn't hate it because she was an old lady, and old ladies are always perfect and innocent in every possible way. I hated it because Kilpack refuses to cast the real murderer in the same suspicious light as all the other suspects. She gives you nothing to question, so then, in the grand and dramatic reveal, you feel like you've been knocked flat on your back. I feel like a broken record since I know I've said similar things about the first four books, but I have to say them again since they (unfortunately) still apply: a really well-thought-out mystery will make the reader slap their forehead in disbelief and say, "I should have seen that coming!" instead of pound their head on the table in frustration and say, "And the person with the spotless record is once again villainous." What I'm trying to say is that, however hidden, there should have been little hints or details along the way that I'll be able to look back on and say, "Oh, yes, she really was capable of murder because of this, this, and this." Instead, even once I know the motive, it still feels unbelievable to me because there didn't seem to be a proper set-up. This is the type of book where you get the impression that there's no overarching goal for the entire series (which, I don't think there is and never was intended to be). The way the book ends, there's the potential for more (and there are currently four more published), but it could also easily be the last one. I'm just curious about Kilpack's writing strategies (here I go again, analyzing and supposing things that are none of my business): when she sits down to write a new Sadie Hoffmiller mystery, does she review the previous ones and think, Oh, it's too bad I had ________ happen in the second one because I really wish I could do _________ in the sixth one, but now I can't. I think for me, who really likes to plan ahead, this would be a difficult way to write (and it seems probable that she does plan ahead to a certain extent and saves ideas for later books, so I'm not totally negative in my judgment). Another thing I've mentioned with the other books, and that applies to this one as well, is just that sometimes the writing includes details that don't really seem necessary and just contribute to the overall wordiness. Like these two sentences: "She hurried to the bedroom for the cordless, then hung up the wall phone after verifying that Gayle was still on the line. Then she went to the living room and twisted the wand to open the slats." For me, all the information about switching phones and opening the blinds is just superfluous to the plot at hand. There were also some details that didn't match up in the story, and that annoyed me a little bit, too. For example, at first Lois said that Jeremy was Jolene and Gary's younger son, but then later on, Sadie refers to him as their firstborn. Also, May insists that Sadie buys organic of everything, but then later on, it appears that she doesn't care anything about the quality of what she eats. I understand that these books are being published fairly quickly (usually two each year), but it still detracts from the story when details don't match up. Sadie is funny. I love her personality. Here are a couple of my favorite lines: "Not only had she lost her quarry, but she was going to get her first ticket in twenty-five years for not-really-talking on a cell phone." And this one: "Finally, after what she assumed was eight full minutes--she might have to write to Reader's Digest about that--she heard another creak of the chair." I know I'm taking these both out of context, so they're probably not funny to you, but Sadie is constantly making me laugh and smile. They're fast-paced and intriguing. I think Kilpack does an excellent job of setting the stage and introducing the characters and including a lot of interesting complexities. I wish it played out differently, but I can't deny that I'm hooked until I've turned the final page. The covers--I really do love the covers. They're aesthetically pleasing, and they pull me in every time. I've kind of come to terms with these books. I realize going into them that there will be things that make me crazy but that it will be a fun ride anyway. Okay, now I just want some blackberry crumble. And at least people comment on your posts! Don't feel ashamed of the length. Amy, I love your blog!!!!! Your writing and your honesty and your wit and your everything. Keep writing and keep reading and thank you thank you thank you for being Mrs. Awesomeness. Loves to you and Mike! Have you read any of the Flavia books? Sweetness at the Bottom of the Pie is the first in the series. They are mysteries as well... reading this review reminded me of them, I bet you'd enjoy! I'll have to find the first one in this series. You had me worried for a minute... I love your "wordy" posts, every single word. Yes, it's true that being concise is a sign of great writing. However, not all writers are alike, thank goodness. If the extra words contribute considerably to the enjoyment of the reader then it's definitely worth those extra words. And I can truthfully say that this reader appreciates your thorough (and thoroughly entertaining) reviews. Now... I'm sure I could whittle all of that down into one sentence- but I'm not gonna! These are my "mindless" reading. I can skip through the book and I don't feel like I'm missing anything. They're fun to read. I've thought of making some of the recipes but haven't actually gotten to any of them.